These curtains of coloured light that appear in the sky, predominantly in the Arctic and Antarctic regions of the earth, are known as the Aurora Borealis or Northern Lights (or Aurora Australis and Southern Lights). What courses these beautiful Northern Lights, dancing displays of nightlights, is a level of interaction of sorts between the sun and the earth. The sun gives off high-energy charged particles that travel into space at very high speeds of 320 to 650 kilometres per second. A cloud of these particles is called plasma. The stream of plasma coming from the sun is known as solar storms and as the solar wind interacts with the edge of the earth's magnetic field, some of the particles begin flowing around the earth and become trapped in by the earths magnetic field. Eventually the particles collide with the gases in the ionosphere, which causes them to glow. 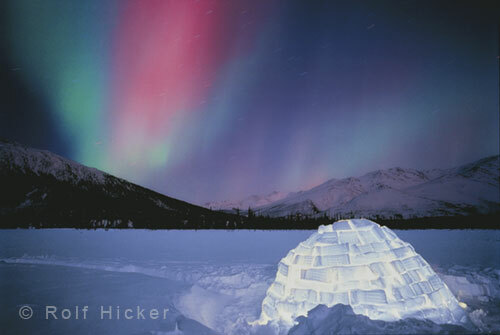 The colours given off during this phenomenon can range depending on how high the gases are in the ionosphere but include red, green, blue, and violet. Aurora borealis are always moving because of the constant changing of interaction between the solar wind and the earth's magnetic field. The best time for viewing and taking Aurora Borealis photos seems to be in the fall and spring in the arctic regions like the Yukon, Manitoba or Alaska.